mountains & mode: Vinho Verde - A Cool Wine or Not? I'm in love, with Vhino Verde. Have you ever tried it? It's sooooo good. Light, dry, crisp and bubbly, almost like champagne, but not. Vinho Verde is a Portugese, (typically) white wine translating to "green wine" not for its color but for its youth. 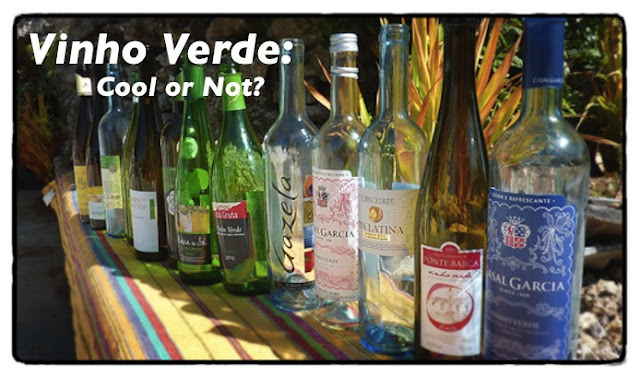 Vinho Verdes are best enjoyed within a year of bottling and thus, are usually inexpensive, costing around $8 a bottle. Tasty and cheap equals my kind of beverage. But here's the thing...I feel like Vinho Verde might not be a cool wine. Like it might be considered in the same wine genre as White Zinfindel. Gasp! I know. I've tried looking up it's cool factor. So far I've learned that Wine Lovers Page calls it cheap and good; Bon Appetit writes it's "delicious, zingy, lively, clean and cheap...if it were a soda, it would be Mountains Dew" (but is it cool to drink the Mountain Dew of wine? ); and Food and Wine proclaims it's "light and lovely...the perfect lunch wine." It seems that the overall consensus of Vinho Verde is that it's a light and refreshing, budget-friendly, summer-time wine. I like all those things. They seem cool to me. So am I in love with an uncool wine? Don't know. Don't care. It's my party blog and I'll cry drink Vinho Verde if I want to.